I created this website for just one reason. YOU! All of us become patients one day and physicians are no exception. After recovering from my own life-threatening illness, I realized that we physicians are often unaware of what our patients truly need. Patients understand that physicians may not always be able to cure them of their medical condition. Sometimes the best treatment we can provide our patients does not come in a pill or a surgical procedure but rather in the form of an understanding ear. I am often surprised by the countless number of patients who do not have a good understanding of their disease, their medications, or their treatment options. This lack of understanding translates to poor patient compliance and suboptimal treatment outcomes. Introduce you to the one of the most technologically advanced specialties of medicine known as Interventional Radiology (IR) that has pioneered some of medicine’s greatest advancements including angioplasty and stenting. Serve as an educational resource for the treatment of deep vein thrombosis (DVT), post thrombotic syndrome (PTS), pulmonary embolism (PE), chronic venous insufficiency (CVI) and varicose veins. Educate the public about the ever-increasing role of revolutionary IR treatments for primary liver cancer (hepatocellular carcinoma), lung cancer, and kidney cancer. These minimally invasive nonsurgical treatments are also used to control tumors that have spread to the liver from breast, stomach, esophageal, pancreatic, and neuroendocrine cancers. As you navigate this site, I welcome any comments or feedback to help me improve this site. Whatever your medical condition, there is a good chance that an IR may play a role in your care. Ask your doctor about a referral to an interventional radiologist or go to Society of Interventional Radiology (SIR) website to find an interventional radiologist in your area. The writings on my blog and on this website should NOT be taken as medical advice. Please discuss your treatment options with you doctor. My opinions are my own and do not reflect the views or opinions of the University of Pennsylvania Health System. I will reference sources when applicable. Please do NOT confuse a blog post with a scientific paper or peer-reviewed reference. The goal of my blog is to educate not diagnose or treat. Patient information has been changed to protect the privacy of patients. I make mistakes just like anyone else. If I am wrong about something, please feel free to contact me and point out my mistake so that I can improve my blog. WordPress requires your email to comment. Your email address is kept confidential and will never be published. I am a Vascular Interventional Radiologist (IR) at the world-renowned Hospital of the University of Pennsylvania (HUP) and the top-ranked Abramson Cancer Center. I am also Assistant Professor of Clinical Radiology & Surgery at the University of Pennsylvania Perelman School of Medicine – the first medical school established in the United States and one of the leading medical schools in the world. I was born and raised in Ohio. As a young boy my father, a prominent cardiothoracic surgeon, would take me on rounds to see patients on the weekends. It was father-son time and some of my fondest childhood memories. With his warm smile and gentle hand, my father had a gift for making his patients feel safe and special. After rounds, we would have lunch and then go to the carwash on the way home. With a successful surgeon-father and a very loving and nurturing mother who encouraged me to follow my heart, I decided to pursue a career in medicine and become a surgeon like my father. I graduated from Case Western Reserve University and then received my Doctor of Medicine (MD) degree from New York Medical College. I began my five-year General Surgery residency program at the Washington Hospital Center/Georgetown University. Towards the end of my surgical residency, I realized that for many medical conditions, traditional open surgery was being replaced by more advanced minimally invasive interventional radiology procedures that could be performed through a pinhole without incisions. As a result, I resigned from my surgical residency and began my journey to become an interventional radiologist. My journey started as a research fellow for two years at the prestigious National Institutes of Health under Dr. Bradford Wood, one of the leading interventional radiologists specializing in minimally invasive cancer treatments. Thereafter, I completed a four-year Diagnostic Radiology residency at the University of Pittsburgh Medical Center (UPMC) where I had the privilege of working with one of the founding fathers and pioneers of IR, Dr. Mark Wholey. I then completed a one-year fellowship in Vascular Interventional Radiology at the George Washington University Medical Center where I trained under one of the preeminent interventional radiologists practicing today and the former Chief of IR at The Johns Hopkins Hospital, Dr. Anthony C. Venbrux. 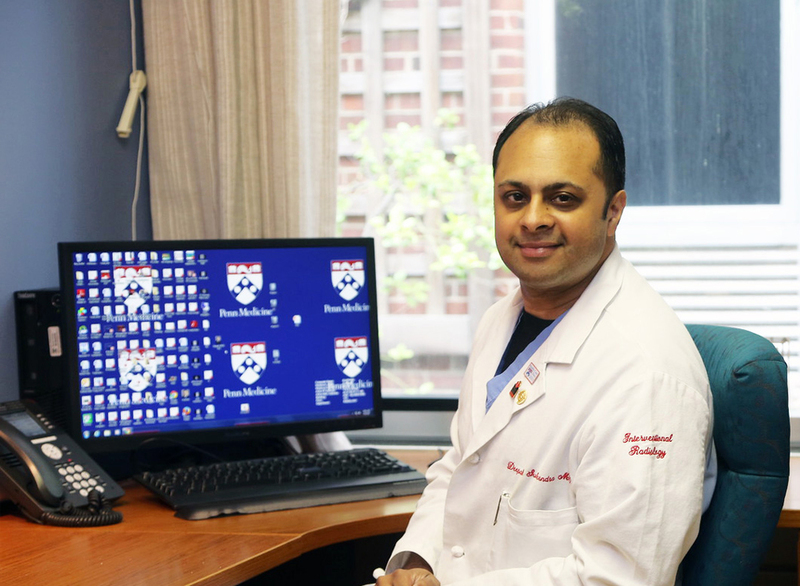 After my fellowship, I joined the faculty of Penn Interventional Radiology where I have a very robust clinical practice in addition to teaching medical students and residents. I specialize in acute and chronic DVT including May Thurner syndrome, venous insufficiency and varicose veins, and minimally invasive cancer therapies. In addition, I have expertise in surgical critical care medicine – a unique skillset possessed by few IRs practicing today. I am Board Certified in Diagnostic Radiology and Vascular Interventional Radiology. In 2017 in honor of my contributions to the field of IR, I was inducted to Fellowship of the Society of Interventional Radiology (FSIR) which is bestowed on less than 10% of members of the Society of Interventional Radiology (SIR). My wife Preeti is a physician too. She is a medical oncologist specializing in breast cancer. She teaches me a lot. I am also a proud father to a 3 year old boy and a 1 year old girl, both of whom captured my heart from the moment they held my finger in their little hands.